A quartet of Republicans make their case to succeed Mark Norris as state senator from District 32. In the first of two scheduled formal debates this week, the four Republican candidates to succeed newly minted federal judge Mark Norris in his vacated District 32 state Senate seat struggled to separate themselves from each other before an audience largely composed of pre-existing partisans for one hopeful or another. At the affair, sponsored by the Bartlett Chamber of Commerce at the Bartlett Performing Arts and Conference Center, the four candidates — former County Commissioner George Chism; Covington businessman Paul Rose; former County Commissioner Heidi Shafer; and former state Representative Steve McManus — did their best to make sense in a lightning-round format in which they had a maximum of one minute to answer thematic questions of some complexity. 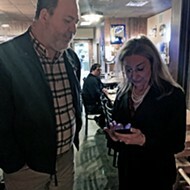 Paul Rose (left) and Heidi Shafer speak at a debate in Bartlett. Asked first how they would undertake the task of representing a district that is equal parts rural and suburban, the candidates complied with short answers: Collierville resident Chism proclaimed, "I understand what the rural life is all about"; Covington's Rose said, "I recognize that rural and suburban areas exist and complement each other"; Shafer, formerly of Memphis, now of Lakeland, noted that she was "raised on a farm" and knew all about corn, bean, wheat, and milo, adding, "We got out of cattle when I was about three"; and Cordovan McManus said, "I would not forget the little guy" and proclaimed it his mission to open up rural access to broadband. Other subjects covered in the debate were Memphis vs. the Suburbs, concerning which, all four boasted their pride in the suburban municipal school systems while promising both fairness and toughness regarding Memphis. On infrastructure, all four vowed to find means to compete with Mississippi throughways that are more convenient for recruiting industry. Speaking on education, all pledged to see that the best teachers were hired and paid appropriately. When it came to health care, all four did their best to wriggle away from anything resembling a commitment to Medicaid expansion under the Affordable Care Act, though Chism probably deserves kudos for allowing as how it might be efficacious to redesign the ACA to make it more user-friendly. Chism also gets points for his unique self-description: "I'm the only one who looks like me and talks like me and quacks like me." Rose gets the honors for sounding both most conservative and most Trumpian when he discounted the ACA (aka "Obamacare") by saying he would prefer to help create more jobs so as to get people off the public health rolls (by which he apparently meant TennCare), and when he said the best defense to the crisis of abuse via opioids and other drugs would be to build a wall. He seemed a mite inconsistent when he joined the others in desiring to get more of "our money" back from state taxes but disdained claiming any "Washington money" for health care. 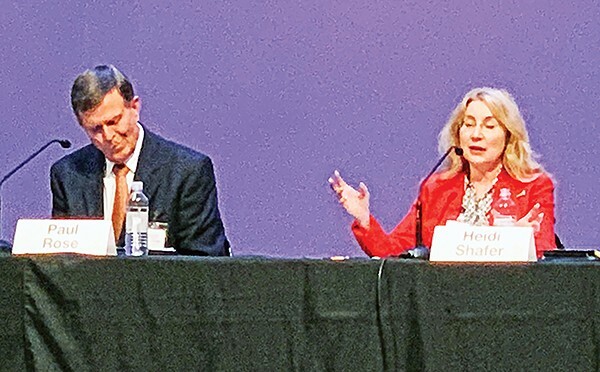 The two candidates who seemed most in their wheelhouse in dealing with a particular question were Shafer, who dealt with the opioid matter by itemizing her leadership on the county commission in establishing counter-measures that have been cited, she said, by the U.S. Department of Health and Human Services, and McManus, who said that whoever wins the special election for District 32 would be taking office in mid-budget season this year and noted that only he had been through a legislative budget season. The GOP candidates were slated to go after it again in public debate at Germantown's Pickering Center on Wednesday evening.